Today’s the 30th anniversary of the day Ferris Bueller and his friends Cameron and Skye ditched school in “Ferris Bueller’s Day Off”. Ferris is definitely one of film’s best antiheroes. Here are some others. 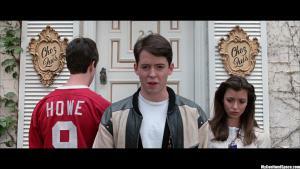 Ferris Bueller reminds his friends what Carpe Diem is all about. 1. Ferris Bueller: A teen charmer who told us that “Life moves pretty fast. If you don’t stop and look around once in a while, you could miss it.” Known for using his widespread popularity for sympathy, and using his friends to get what he wants, Ferris Bueller is the perfect teenage anti-hero who made it seem socially acceptable to ditch school. Despite lying to his parents about being sick, convincing his best friend to steal his dad’s Ferrari, impersonating a customer for a dining reservation, Bueller’s manipulation was used for one good thing, Carpe Diem.